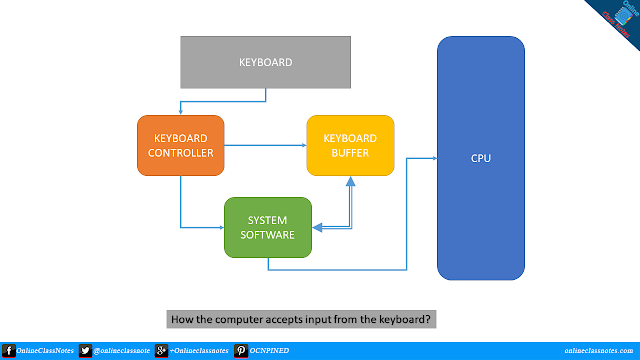 How the computer accepts input from the keyboard? When we press a key, a tiny chip in the keyboard called keyboard controller notes that a key has been pressed. Keyboard controller places a coed in the buffer of the keyboard to indicate which key was pressed. Keyboard buffer is a temporary memory of the keyboard controller. The keyboard controller sends a signal to the system software notifying that something happened at the keyboard. When the system receives the signal it determines the appropriate response. When a keystroke has occurred, the system reads the memory location in the keyboard buffer that contains the code of the key which was pressed. The system software then passes that code to CPU.